(TB2QA9P) Look Twice Geocoin - Todie's Wild Ride: Where R U Going? Todie's Wild Ride: Where R U Going? In the hands of MattB2007. Use TB2QA9P to reference this item. 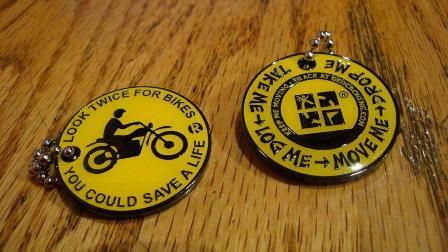 My mission is to travel the world spreading the message of Motorcycle and Bicycle awareness. It doesn't matter where you or I go. Just remember to be cautious of cyclists around you. They don't have a cage to protect them in an accident. This is a Look Twice geocoin given to me from Write Shop Robert to join the Todie's Wild Ride mission. Please help this coin move quickly from cache to cache to complete it's mission and spread the word about Motorcycle/Bicycle awareness. Share the road! Gallery Images related to Todie's Wild Ride: Where R U Going? Discovered this at the 7th Annual Texas Challenge - thanks for sharing! Very nice coin with an important message to share. Thanks for sharing at the Texas Challenge! I discovered this at the 2009 Texas Challenge. Thanks for sharing. Thanks for sharing this coin with the wild and the message..yes I too try to be aware of such motorist. loved the message on coin just to let everyone know it's to be moved around. Discovered this one at the 2009 Texas Challenge in Fredericksburg. Awesome coin. Picked it up at the 2009 Texas Challenge. Will take it back to the Houston area with me and move it along soon.